I survived our first week of swimming lessons and, despite a dead car battery yesterday morning -- which was jump started minutes before we needed to leave by a neighbor we don't really know and who had still been sleeping (oops! ), we did not miss even one of the children's classes. Snuggles is still not very happy to be in the pool (yeah, he SCREAMS the whole time!) but Chiquita is swimming wonderfully and was once again "diving" off the board today! Nevertheless, I am SO happy to be home this weekend knowing that I don't have to go back until Monday!! Inspired by Twinkle Toes' Godmother, who also uses Right Start Math, I organized all of our Math supplies. Do you use Right start Maths? Are all those manipulatives fkor taht? They look so tempting in those little draws. 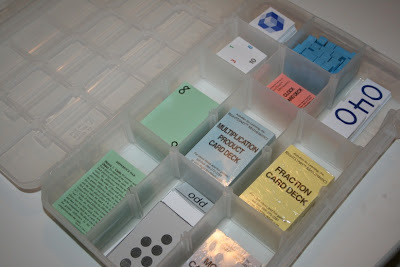 OOOOOOooooooo that is a spectacularly good idea for organizing all those little supplies for RS Math!! I think that I am stealing that idea right out from under you!! Yippppeeeeeee!!!!!! is it weird to get all excited to see someone else also make progress organizing? I am doing my linen closet this week. I am so happy. Your girls room looks great! Gae ~ Yes, we do use Right Start Math and the picture I posted is all of the manipulatives for the levels we are currently using. Right Start uses lots of "Math Games" instead of drills which my children love! If you click on my label for Math you can read more about the program. Hope that helps! Currently all our RS stuff is in a washing basket... and it's driving me nuts a bit! What's the box that has all the game cards in it? How many of those drawers has it taken you to store all the stuff? I know what you mean about it all driving you nuts -- that was me last year! I am so excited about having it all organized for this coming year. I found the box in the Scrapbooking section at Walmart. I can't quite remember what it was called, but the little dividers inside are moveable. As for the drawers, I have everything for levels A-D, other than the actual books and the balance in 3 drawers -- with a little extra room to spare. I'm SO late reading this...I did Mr. Linky last week, but did not have my favorite time to just sit and read these....really proud of you. Thanks for taking the time to share!